What are the symptoms of carbon dioxide poisoning? What is the structure of the respiratory system? What are the different between inhalation and exhalation? What is the process of the respiratory system? What are other important events during the breathing cycle? The lungs exchange oxygen and carbon dioxide between the air we breathe and the blood. The tracheobronchial tree is the passage way from the mouth to the interior of the lung. Gas exchange occurs in the alveoli deep in the lungs. Breathing air in (inhalation) requires muscular effort. Air is warmed, humidified, and cleaned by the nose and lungs. The lungs are a pair of organs in the chest that are primarily responsible for the exchange of oxygen and carbon dioxide between the air we breathe and the blood. The cells in the body constantly need a new supply of oxygen to produce energy. With lack of oxygen, cellular function is impaired and damage or cell death may occur. As energy is utilized, waste products are created, one of which is the gas carbon dioxide. Eliminating carbon dioxide from the body is just as important as breathing in oxygen from the air. If carbon dioxide builds up in the blood it will lead to headaches, drowsiness, coma, and eventually even death. Air enters the body via the nose (preferably) or the mouth. The air enters the main windpipe, called the trachea, and continues en route to each lung via either the right or left bronchus (plural=bronchi). 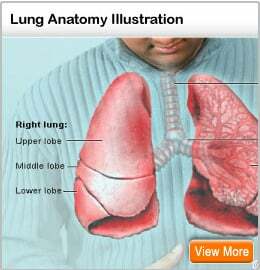 The lungs are separated into sections called lobes, two on the left and three on the right. The air passages continue to divide into ever smaller tubes, which finally connect with tiny air sacs called alveoli. This gradually branching array of tubes is referred to as the tracheobronchial "tree" because of the remarkable similarity to the branching pattern of a tree. The other half of the respiratory system involves blood circulation. Venous blood from the body is returned to the right side of the heart and then pumped out via the pulmonary artery. This artery splits in two for the left and right lungs and then continues to branch much like the tracheobronchial tree. These vessels branch into a fine network of very tiny tubes called capillaries. The capillaries are situated adjacent to the alveoli and are so small that only one red blood cell at a time can pass through their openings. It is during this passage that gases are exchanged between the blood and the air in the nearby alveoli. After passing the alveoli, capillaries then join together to begin forming the pulmonary veins, which carry the blood back to the left side of the heart. 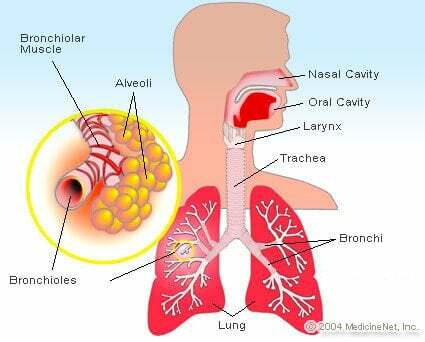 Respiration is divided into two components, inhalation and exhalation. Inhalation is active, because it requires muscle contraction. The major muscle of respiration is a sheet-like dome shaped muscle called the diaphragm that is located below the lungs. The diaphragm separates the chest and abdominal cavities. As the diaphragm contracts, it flattens out, moving toward the abdominal cavity. This action causes an increase in the size of the chest cavity, thus creating a vacuum. Air is then sucked in through the mouth or nose. When physical activity increases dramatically, or with some lung conditions, other muscles like those of the neck and those between the ribs also assist in the increase in size of the chest cavity. These muscles are referred to as accessory muscles of respiration. Exhalation is passive because it does not require muscle contraction. During this phase, the expanded lung acts like a stretched rubber band and simply contracts to its resting position. This contraction forces air out of the lungs and through the mouth. As energy is utilized by cells, one of the waste products is the gas carbon dioxide. Oxygen-enriched red blood cells release oxygen to the cells of the body and then pick up the waste carbon dioxide. This oxygen- deprived, dark blue blood is then delivered to the blood vessels of the lungs. Carbon dioxide is released by the red cells, easily passes through the capillary wall into the space in the air sac of the adjacent alveoli, and is then eliminated with each breath out of the mouth (exhalation). Oxygen present in the air sac easily passes into the capillaries and into the red blood cells. The capillary network carrying this oxygen-rich, bright red blood flows to larger vessels and eventually empties into the left side of the heart where it is pumped to all the tissues of the body. Thus, the cycle or circle of blood is complete; hence, the name circulation. Outside air needs to be heated and moistened to match the body's temperature and humidity. As air passes down the tracheobronchial tree, it is warmed and water is added. Contaminants must also be removed. Nose hairs and tiny microscopic hairs called cilia, along with sticky mucus produced by the lining membrane help cleanse the air of impurities. Cilia beat in a synchronized fashion brushing any collected dirt and mucus up toward the mouth. The accumulated material is then coughed out or swallowed. By the time the air reaches the alveoli, it is virtually sterile.